Please answer the following questions to help us improve the website and start your download! 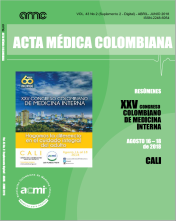 What is your opinion about the scientific content of Acta Médica Colombiana? Would you leave us some feedback for our next issues?